Depending on the school(s) in Texas that you are applying to, there’s a good chance you will need to answer any combination of Topics A, B or C.
Topic C: The Most Important! This prompt is more straightforward than A or B.
It’s asking you to explain how you are preparing to achieve your goals in life. Many college admissions experts believe this is the most important of the three essays, and that if possible, students should mention their intended major, and build a strong case for why they would be successful at it in college and beyond. If you want to go into one of the more competitive majors, such as business or engineering, you need to “prove” why you deserve a spot in the college or university’s program. Even if you aren’t sure what you want to study or do–and most students don’t–try your best to show that you actually do know and are certain. For many students, the hardest part is figuring out what those goals are at this point in their lives. Before you start writing, brainstorm and take notes about your goals. Then, start listing what has prepared you for them, and how you expect your future school will help continue to prepare you for them. If you can find a major that lines up with those goals, mention it in your essay, and why you are already poised to succeed at it. 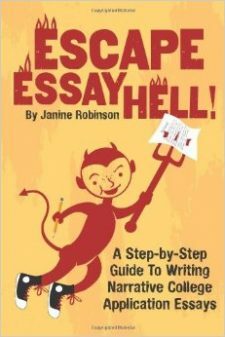 To write this essay, you need to be able to state your goal or goals in a sentence or two. This can be hard if you aren’t sure of them. My advice is just be honest. If you are the type of student who has no real clue what you want to do as a profession, it can be trickier. But not impossible. You might need to explain your goals on a more abstract or personal level. You want to find a way to serve disadvantaged youth. You want to discover new sources of renewable energy. You want to learn about finance and business and possible start your own company some day. Write down these goals in a few sentences. Even if you truly have no idea about your future, you need to have something in mind to write a decent essay. Use your best guess. Then state it as fact. Remember, no one is going to come back at you in a couple years and call you out for not following whatever goals you write about now. A great way to focus this essay is to determine what personal quality or qualities you have developed that will make you effective at reaching your goal(s), and then collect some of the experiences or activities in school and out where this has happened. Say you want to be a nurse. What personal quality have you developed that will make you not only a nurse, but an awesome one? Did you learn empathy while volunteering with seniors at a nursing home? Or patience? Then, think of experiences and activities in school and out where you learned specific skills that could help you meet your goals. If you want to be a nurse, did you have a grandmother or relative who was sick who you helped care for? Did you take a first-aid course at summer camp? Did you find your anatomy class of special interest? Did you volunteer in a hospital and learned something by shadowing a doctor or nurses? After sharing what you did in high school that helped prepare you for you goal(s), now investigate what your target colleges offer to continue to prepare you. This part can be harder to come up with. Check out the web sites of your target schools. See what specific majors, programs, courses, internships, etc. they offer that could help prepare you for your area of interest and life goals. Once you have collected notes on your life goal(s), and a list of what has prepared you so far to meet them, and what you anticipate will further prepare you in college, it’s time to write. Go back to the sample outline I shared at the beginning of this post, and start to craft your ideas into “chunks” or paragraphs in an order that makes sense. Usually, starting from the earliest activities and describing them from there in chronological order works the best. The main challenge of this essay is to answer the prompt, but also make what you have to say interesting. Instead, start by sharing some simple real-life moment from your past where you first realized you enjoyed helping people (or got your first taste of it), especially those who were ill or somehow impaired. Then go into how you want to be a nurse, and why, and go into the various activities that have prepared you so far. 2. State what your goal(s) is, and when you embraced it and consciously started to pursue it. 3. Explain what has prepared you (mainly in high school) so far for meeting this goal. Include both qualities and skills that you developed throughexperiences and activities in school and other places, such as clubs, hobbies, sports, volunteering, travel, etc. 4. Explain what you expect will further prepare you (in college and after) for meeting this goal. Good luck with Apply Texas!